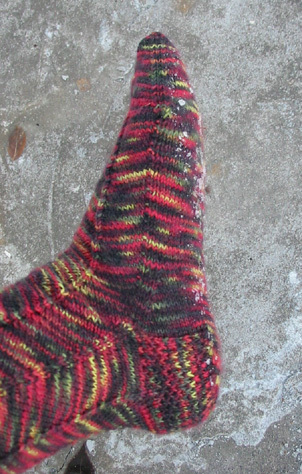 This pattern was developed by Grumperina for her sockapal-2-za pal. It was so very interesting to see her documenting the whole process - I had to knit these socks, too. What is more, for the first time, I actually had the yarn in stock the pattern called for. Not that I really care for that, but it looked like fated. I followed the pattern instructions very closely (knitting the bigger size) and have to say that it is very well written and easy to follow. I am still not happy with the cuff ribbing, though. But I had no other idea and was too eager to go on with the increase/decrease knitting for doing my own research for a better solution. However, do not care about my animosity. I usually have problems with cuffs and ribbings and if you look close, the cuff looks just perfect in Grumperina's pictures. Want another picture? Look how nice the biased areas embrace the heel. And the heel! Of course, I couldn't stick 100% to the pattern and changed the slip stitch heel into an alternated slip stitch heel (eye of partridge). I had only knit this one in solid colours so far - gosh, I missed all the fun! Otherwise: I adore the fit of this sock. It has a lovely snug fit that almost reminds me of support stockings. No, wait, they are not that tight. Just perfectly cosy for someone who doesn't like saggy socks. The pattern seems to be perfect for variegated yarn, I haven't seen any strange pooling in the gallery of already finished socks! I think I don't have to convince anybody to try this pattern: there is already a knit-along. Go there and join! And yes, that's snow I'm standing on. by Carola at 12:01 f.h. Your socks look wonderful. These are on my to-do list. I just got some Lorna's Laces in the mail that I think will be just right for these. nóvember 28, 2005 1:48 f.h. nóvember 28, 2005 5:04 f.h. carola, i love them! you have done a fantastic job. and the colours are just stunning. nóvember 28, 2005 8:25 f.h. Crikey, they're gorgeous now go get your feet out of the snow! nóvember 28, 2005 1:19 e.h. I love the "eye of partridge" heel, it really looks pretty. 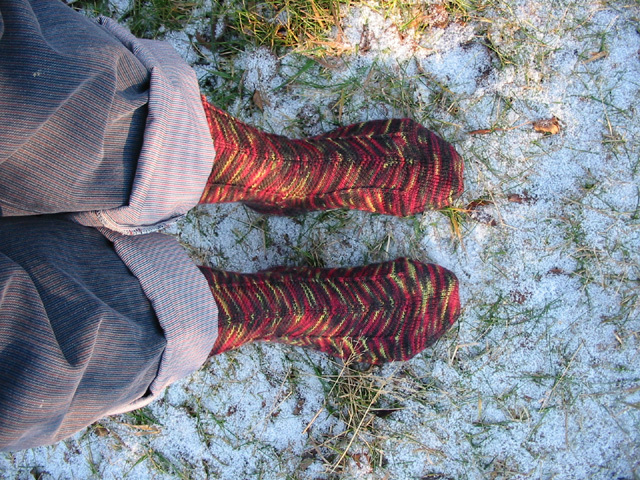 Despite the cosy socks, is standing in the snow not a bit chilly for your toes?? nóvember 28, 2005 5:32 e.h. I'm planning to make some Jaywalkers too, perhaps after I finish the sweater I am working on now. Yours are so pretty! I love the colors. nóvember 29, 2005 12:57 f.h. 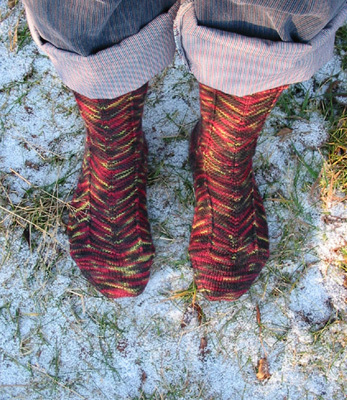 Your Jaywalker socks turned out beautifully. I love the colors of the Opal Handpaint. If you want to see some strange pooling with thus pattern, you should see the pair I knit with Lorna's Laces! nóvember 29, 2005 8:09 e.h.
Wow, that colorway is great! Your socks turned out fab! nóvember 30, 2005 2:24 e.h. I do like the Jaywalker pattern; Kathy knows how to write a good pattern. And your socks are great, Carola! desember 05, 2005 9:26 e.h.
Hmm, you know, the Jaywalker socks might be just the thing to work with the Lorna's Laces sock yarn I have. I think I might try that sometime in the new year. Your socks are gorgeous! The colorway is beauteous! desember 06, 2005 10:58 e.h. Wonderful socks! They are so happy against that snow ;). I've updated the gallery to include them and a link to your blog. desember 21, 2005 4:10 e.h.
mars 13, 2009 6:46 e.h.